George Bernard Shaw was a famous Dramatist from Ireland, who lived between July 26, 1856 and November 2, 1950. He became 94 years old. 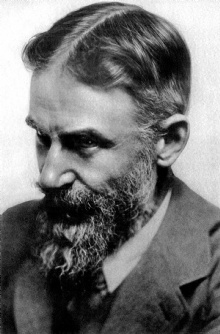 He was an Irish writer and actor game winds af Nobel Prize for Literature in 1925. Shaw's plays have been is entered over the world and often førsteopført on Ireland's national theater, the Abbey Theatre. Shaw was an ardent socialist in modsætning to his lifelong close friend, the writer GK Chesterton, there was civil and Orthodox katolik. He is born under the zodiac leo, who is known for Ruling, Warmth, Generosity, Faithful, Initiative. Our collection contains 168 quotes who is written / told by George, under the main topics: Age, Beauty, Family, Food, Funny. "No man who is occupied in doing a very difficult thing, and doing it very well, ever loses his self-respect"
"It's easier to replace a dead man than a good picture"
"Censorship ends in logical completeness when nobody is allowed to read any books except the books that nobody reads"
"There are two tragedies in life. One is to lose your heart's desire. The other is to gain it"
"The secret of being miserable is to have leisure to bother about whether you are happy or not. The cure for it is occupation"
"I would like to take you seriously, but to do so would be an affront to your intelligence"
"Dancing is a perpendicular expression of a horizontal desire"
"Cruelty would be delicious if one could only find some sort of cruelty that didn't really hurt"
"The man with a toothache thinks everyone happy whose teeth are sound. The poverty-stricken man makes the same mistake about the rich man"
"Progress is impossible without change, and those who cannot change their minds cannot change anything"
"Life contains but two tragedies. One is not to get your heart's desire; the other is to get it"
"Kings are not born: they are made by artificial hallucination"
"Home life is no more natural to us than a cage is natural to a cockatoo"
"Democracy is a form of government that substitutes election by the incompetent many for appointment by the corrupt few"
"You can always tell an old soldier by the inside of his holsters and cartridge boxes. The young ones carry pistols and cartridges; the old ones, grub"
"We should all be obliged to appear before a board every five years and justify our existence... on pain of liquidation"
"The heretic is always better dead. And mortal eyes cannot distinguish the saint from the heretic"
"Nothing is ever done in this world until men are prepared to kill one another if it is not done"
"He knows nothing and thinks he knows everything. That points clearly to a political career"
"Do not do unto others as you expect they should do unto you. Their tastes may not be the same"
"Youth is a wonderful thing. What a crime to waste it on children"
"You are going to let the fear of poverty govern you life and your reward will be that you will eat, but you will not live"
"There are no secrets better kept than the secrets everybody guesses"
"The liar's punishment is not in the least that he is not believed, but that he cannot believe anyone else"
"She had lost the art of conversation but not, unfortunately, the power of speech"
"Reading made Don Quixote a gentleman, but believing what he read made him mad"
"It's so hard to know what to do when one wishes earnestly to do right"
"Hell is full of musical amateurs"
"First love is only a little foolishness and a lot of curiosity"
"The fickleness of the women I love is only equalled by the infernal constancy of the women who love me"
"Silence is the most perfect expression of scorn"
"Power does not corrupt men; fools, however, if they get into a position of power, corrupt power"
"If women were particular about men's characters, they would never get married at all"
"Give a man health and a course to steer, and he'll never stop to trouble about whether he's happy or not"
"Choose silence of all virtues, for by it you hear other men's imperfections, and conceal your own"
"The trouble with her is that she lacks the power of conversation but not the power of speech"
"Self-sacrifice enables us to sacrifice other people without blushing"
"I want to be thoroughly used up when I die, for the harder I work the more I live. I rejoice in life for its own sake"
"What a man believes may be ascertained, not from his creed, but from the assumptions on which he habitually acts"
"Science never solves a problem without creating ten more"
"It is the mark of a truly intelligent person to be moved by statistics"
"If history repeats itself, and the unexpected always happens, how incapable must Man be of learning from experience"
"Democracy substitutes election by the incompetent many for appointment by the corrupt few"
"Capitalism has destroyed our belief in any effective power but that of self interest backed by force"
"Why, except as a means of livelihood, a man should desire to act on the stage when he has the whole world to act in, is not clear to me"
"Which painting in the National Gallery would I save if there was a fire? The one nearest the door of course"
"When I was young, I observed that nine out of ten things I did were failures. So I did ten times more work"
"When a stupid man is doing something he is ashamed of, he always declares that it is his duty"
"When a man wants to murder a tiger he calls it sport; when a tiger wants to murder him he calls it ferocity"
"When a man says money can do anything, that settles it: he hasn't got any"
"What we want is to see the child in pursuit of knowledge, and not knowledge in pursuit of the child"
"What Englishman will give his mind to politics as long as he can afford to keep a motor car?" "Virtue consists, not in abstaining from vice, but in not desiring it"
"Very few people can afford to be poor"
"Until the men of action clear out the talkers we who have social consciences are at the mercy of those who have none"
"Those who do not know how to live must make a merit of dying"
"There is nothing more dangerous than the conscience of a bigot"
"There is no subject on which more dangerous nonsense is talked and thought than marriage"
"There is no satisfaction in hanging a man who does not object to it"
"The power of accurate observation is commonly called cynicism by those who have not got it"
"The possibilities are numerous once we decide to act and not react"
"The perfect love affair is one which is conducted entirely by post"
"The people who get on in this world are the people who get up and look for the circumstances they want and if they can't find them, make them"
"The only way to avoid being miserable is not to have enough leisure to wonder whether you are happy or not"
"The only service a friend can really render is to keep up your courage by holding up to you a mirror in which you can see a noble image of yourself"
"The only secrets are the secrets that keep themselves"
"The natural term of the affection of the human animal for its offspring is six years"
"The moment we want to believe something, we suddenly see all the arguments for it, and become blind to the arguments against it"
"The minority is sometimes right; the majority always wrong"
"The faults of the burglar are the qualities of the financier"
"The fact that a believer is happier than a skeptic is no more to the point than the fact that a drunken man is happier than a sober one"
"The British soldier can stand up to anything except the British War Office"
"The art of government is the organisation of idolatry"
"Perhaps the greatest social service that can be rendered by anybody to the country and to mankind is to bring up a family"
"People become attached to their burdens sometimes more than the burdens are attached to them"
"Patriotism is your conviction that this country is superior to all others because you were born in it"
"Parentage is a very important profession, but no test of fitness for it is ever imposed in the interest of the children"
"Only on paper has humanity yet achieved glory, beauty, truth, knowledge, virtue, and abiding love"
"Old men are dangerous: it doesn't matter to them what is going to happen to the world"
"Oh, the tiger will love you. There is no sincerer love than the love of food"
"Men are wise in proportion, not to their experience, but to their capacity for experience"
"Martyrdom: The only way a man can become famous without ability"
"Marriage is popular because it combines the maximum of temptation with the maximum of opportunity"
"Marriage is good enough for the lower classes: they have facilities for desertion that are denied to us"
"Marriage is an alliance entered into by a man who can't sleep with the window shut, and a woman who can't sleep with the window open"
"Man can climb to the highest summits, but he cannot dwell there long"
"Love is a gross exaggeration of the difference between one person and everybody else"
"Life would be tolerable but for its amusements"
"Life levels all men. Death reveals the eminent"
"It is dangerous to be sincere unless you are also stupid"
"It is a curious sensation: the sort of pain that goes mercifully beyond our powers of feeling. When your heart is broken, your boats are burned: nothing matters any more. It is the end of happiness and the beginning of peace"
"Independence? That's middle class blasphemy. We are all dependent on one another, every soul of us on earth"
"In this world there is always danger for those who are afraid of it"
"In heaven an angel is nobody in particular"
"In a battle all you need to make you fight is a little hot blood and the knowledge that it's more dangerous to lose than to win"
"Imagination is the beginning of creation. You imagine what you desire, you will what you imagine and at last you create what you will"
"If you must hold yourself up to your children as an object lesson, hold yourself up as a warning and not as an example"
"If you leave the smallest corner of your head vacant for a moment, other people's opinions will rush in from all quarters"
"If you injure your neighbour, better not do it by halves"
"I often quote myself. It adds spice to my conversation"
"I never thought much of the courage of a lion tamer. Inside the cage he is at least safe from people"
"I never resist temptation, because I have found that things that are bad for me do not tempt me"
"I have to live for others and not for myself: that's middle-class morality"
"I enjoy convalescence. It is the part that makes the illness worth while"
"I am afraid we must make the world honest before we can honestly say to our children that honesty is the best policy"
"I am a Christian. That obliges me to be a Communist"
"Human beings are the only animals of which I am thoroughly and cravenly afraid"
"Few people think more than two or three times a year; I have made an international reputation for myself by thinking once or twice a week"
"Few of us have vitality enough to make any of our instincts imperious"
"Fashions, after all, are only induced epidemics"
"Except during the nine months before he draws his first breath, no man manages his affairs as well as a tree does"
"Every person who has mastered a profession is a skeptic concerning it"
"Do not try to live forever. You will not succeed"
"Beware of the man who does not return your blow: he neither forgives you nor allows you to forgive yourself"
"Beware of false knowledge; it is more dangerous than ignorance"
"Better keep yourself clean and bright; you are the window through which you must see the world"
"Beauty is a short-lived tyranny"
"Assassination is the extreme form of censorship"
"An index is a great leveller"
"A gentleman is one who puts more into the world than he takes out"
"A fashion is nothing but an induced epidemic"
"A broken heart is a very pleasant complaint for a man in London if he has a comfortable income"
"An Englishman thinks he is moral when he is only uncomfortable"
"An election is a moral horror, as bad as a battle except for the blood; a mud bath for every soul concerned in it"
"An asylum for the sane would be empty in America"
"Americans adore me and will go on adoring me until I say something nice about them"
"All my life affection has been showered upon me, and every forward step I have made has been taken in spite of it"
"Alcohol is the anesthesia by which we endure the operation of life"
"A veteran journalist has never had time to think twice before he writes"
"A perpetual holiday is a good working definition of hell"
"A man who has no office to go, to I don't care who he is, is a trial of which you can have no conception"
"A man of great common sense and good taste - meaning thereby a man without originality or moral courage"
"A man never tells you anything until you contradict him"
"A little learning is a dangerous thing, but we must take that risk because a little is as much as our biggest heads can hold"
"Use your health, even to the point of wearing it out. That is what it is for. Spend all you have before you die; do not outlive yourself"
"Every man over forty is a scoundrel"
"Beauty is all very well at first sight; but who ever looks at it when it has been in the house three days?" "Statistics show that of those who contract the habit of eating, very few survive"
"Animals are my friends... and I don't eat my friends"
"A government that robs Peter to pay Paul can always depend on the support of Paul"
"The best place to find God is in a garden. You can dig for him there"
"One man that has a mind and knows it can always beat ten men who haven't and don't"
"Peace is not only better than war, but infinitely more arduous"
"Do not waste your time on Social Questions. What is the matter with the poor is Poverty; what is the matter with the rich is Uselessness"
"Baseball has the great advantage over cricket of being sooner ended"
"Everything happens to everybody sooner or later if there is time enough"